I have been working on the acrylic painting on the top surface of the cottage furniture corner table. 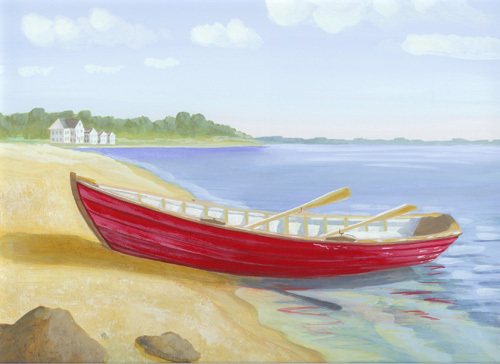 Shown above is a closeup of the red skiff on the shore. As you can see I have added detail as I continued glazing over the painting adding more detail as I paint. The water reflections and the inside of the boat have the most detail. I offer this painting on other products including the kitchen bar stools in all heights, the wood chairs, the tabletop lazy susans and other various sized tables. To see more cottage furniture follow this link to Beach Cottage Art . I will be finishing up this corner table with a nice border around the painting. Check back to see it all finished.